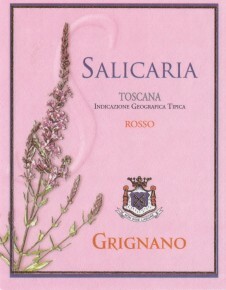 Salicaria, which takes its name from the flowering plant also depicted on the label, is a super Tuscan blend of Sangiovese and Merlot (50/50) aged for 24 months in French barriques (50% new, 50% used). Pure, intensely fruity aromas of raspberry, cinnamon and nutmeg display attractive floral lift. Silky on entry, then minerally and firm in the middle, with a creamy-sweet quality to the red fruit flavors. The long finish features a persistent note of rose petal. Very well made and food-friendly, it will pair beautifully with hearty meat dishes and pastas, Tuscan cold cuts. The grapes are harvested between the 3rd week (Merlot) and the last week of September (Sangiovese). Vinification is carried out in stainless steel tanks at controlled temperature. Malolactic fermentation takes place in French barriques. Aged in French barriques (50% new, 50% 2nd passage) for 24 months, follwed by a minimum of 12 months in bottle prior to release.